I don’t know how I lived without her in my life for so long. She has made my life so much easier, she is now one of my new best friends. I would like to introduce everyone to my Instant Pot. This new addition to my kitchen is a huge time saver at the end of a busy day. And it gets rid of multiple different kitchen devices if you want to declutter your life a bit. It is a rice cooker, pressure cooker, slow cooker and so much more all in one. You can even make your own yogurt if that is something you typically like to do. It cuts my dinner cooking time in more than half. I can put in frozen meat, some spices and veggies and have a healthy meal cooked up in 30 minutes while I am doing homework with my kids. I have joined many different Facebook groups that have helped me to obtain a recipe collection for my Instant Pot. There are tons of recipes on Pinterest and many cookbooks dedicated to this also. For those living Gluten Free and Paleo I recommend this because for the poultry and meat settings alone it keeps the meats moist. If any of you have the old pressure cooker that always scared the heck out of me when it was used you can finally retire it. And they even have one that is Bluetooth capable that links to your phone! So Cool!! I will admit I am still a rookie myself with my Instant Pot but it is so easy to use and Amazon just had a sale on them where they were 50% off. Just keep an eye out for bargains on these. I am a member of a Pediatrician Mommy group on Facebook. We all work long hours and are exhausted after work. And on this group we are always looking for ways to cut down the dinner prep time but not compromise the health of the meals we offer to our families. This groups feeds are now overflowing with everyone praising their InstantPots and the meals that have been made. Healthy living and cooking are something we all have to make the time and effort to commit to. When I find something that can make this easier for me I like to share it with all of you. If you have an Instant Pot already share your experiences with it, if you decide to take the plunge and get one let me know what you think. Live Healthy and Be Well! When you realize that you need to make the change to Gluten Free it can be very overwhelming. My patients start to search the internet and they get bombarded with info. I always try to reassure them and say just start slowly and keep it simple. I recommend starting by giving them a few reliable sources, such as the Gluten Free Diet Guide for Families provided by CDHNF and NASPGHAN. Look for the key words- wheat, barley or rye in the ingredient list of your packaged foods and in the beginning just stick to whole, unprocessed foods. This means keep the diet simple initially – eat fruits, vegetables, dairy and protein. Also a good starting point is to look for the labels on food that state Gluten Free. 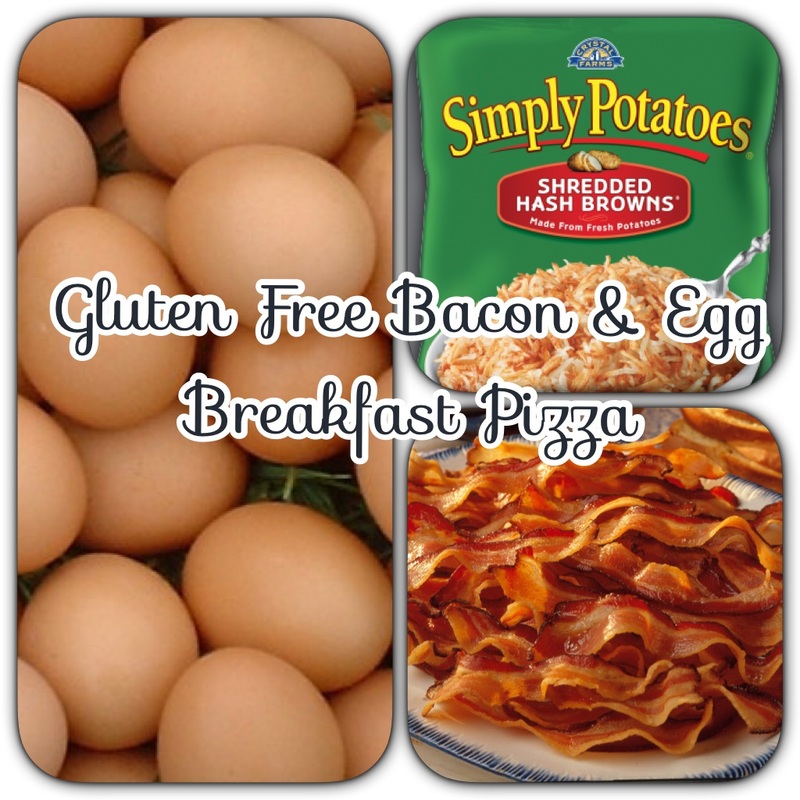 There are many quality gluten free options that you can find in most grocery stores. That being said, realize you may not like the gluten free food the first time you eat it. More importantly, if you are changing to a gluten free diet due to an illness such as celiac disease, you may feel awful from being sick for a long time. Many people don’t have much of an appetite and have lost weight prior to their diagnosis. They may be suffering from stomach pain and no food tastes really good at this point. Gluten free food is different. It takes time for your taste buds to change. I still remember the first time I ate gluten free pasta. My kids did not like the taste of it, it is a bit heavier than white pasta. Start with some of the simple tested and true good gluten free unprocessed food and give yourself time to feel better and time for your taste buds to adjust. For the first few weeks when you are learning, try some of these easy Gluten Free options. Yogurt, Smoothies and Parfaits – Chobani and Stonyfield yogurts are certified GF by the Gluten Intolerant Group. Top with fresh fruit for a great start to your day. Gluten free cereal – there are several GF cereals. General Mills and Van’s Cereals have a few Gluten free options. Pocono Cream of Buckwheat – Buckwheat is good for you and naturally sweet. Top with milk, sugar and cinnamon! Certified Gluten Free Oats – only consume certified GF oats such as Bob’s Red Mill Gluten Free Oats. A sandwich on Udi Bread – you can go gluten free and still eat your favorite GF sandwich toppings on Udi bread. Lunchmeat – Boar’s Head cold cuts and Hormel Natural Choice lunchmeats. For an easy lunch, roll some lunchmeat and cheese together and stick a toothpick in it. Nachos – Tostitos tortilla chips with melted cheese on top. Click on the Tostitos link to see a list of Frito Lay products that are gluten free! Peanut butter on some toasted Gluten Free bread or with some Snyder’s of Hanover GF Pretzels. Fruit and vegetables. Do not underestimate the value of fruit and veggies. We eat more of these than anything else. Cheese is a great option for anyone on a gluten free diet. Gluten is not included in the standard ingredients in cheese that include milk, enzymes and sometimes salt. Most processed cheese is also likely though not guaranteed to be gluten free. You might find wheat in the seasoning and noncaking ingredients used for some shredded cheeses, but anytime wheat is used it must be clearly labeled. I recommend shredding your own cheese if that is how you prefer to eat it. Also blue cheese is also considered safe for those on a gluten free diet. Chips are not necessarily healthy but many are gluten free. Click this link for Frito Lay Gluten Free List. Eat them with hummus, GF salsa or GF guacamole. Real popcorn. Most microwave popcorn is gluten free but save yourself the worry and time and make your own popcorn. Kind bars. My kids favorite GF snack bar! Ice Cream itself is gluten free but may contain products which are made from gluten so avoid ice cream sandwiches, cone products, cookie and ice cream flavors such as Oreo, and flavors which contain brownie pieces, cookie dough and cheese cake etc. Last year I saw only 1-2 Teal pumpkins painted in my neighborhood. It piqued everyone’s curiosity. Many just thought “oh how pretty.” But what is the purpose? 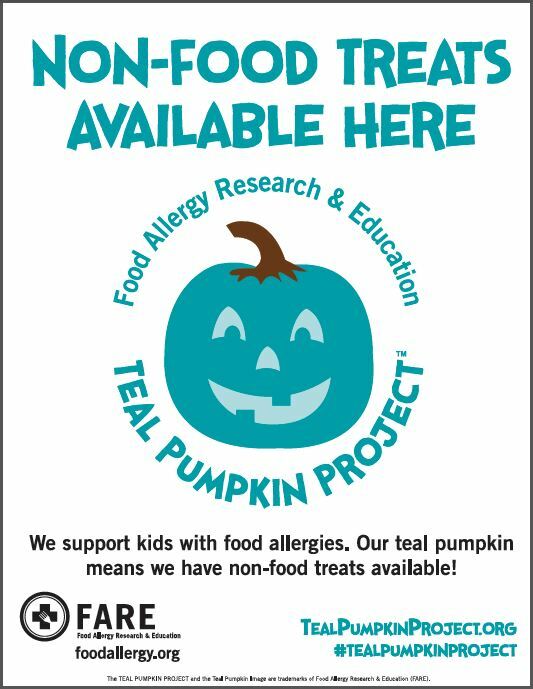 In 2014 the Food Allergy Research & Education (FARE) launched a national campaign called the Teal Pumpkin Project™. The Teal Pumpkin Project raises awareness of food allergies and promotes inclusion of all trick-or-treaters throughout the Halloween season. This nationwide movement offers an alternative for kids with food allergies, as well as other children for whom candy is not an option, and keeps Halloween a fun, positive experience for all! It seems a daunting task at first. Many say, “I don’t want to be the house not giving out candy or chocolate, the kids will hate us and egg our front door!” In reality there are many really cool fun nonfood items that you can hand out. Kids would love to get glow sticks or glow bracelets. They will undoubtedly put them on immediately and use them the rest of the night. Bouncy balls, stickers, tattoos are all great options. You can find a list of recommended Non Gift Treats here at FARE’s website. So who is going to join me this year in painting their pumpkins Teal? Please help spread the read about this!! Share this post and make Halloween a fun experience for every child!! Not sure if you guys can tell but I LOVE breakfast foods, so when I find a yummy recipe I am always trying to convert it over to gluten free. 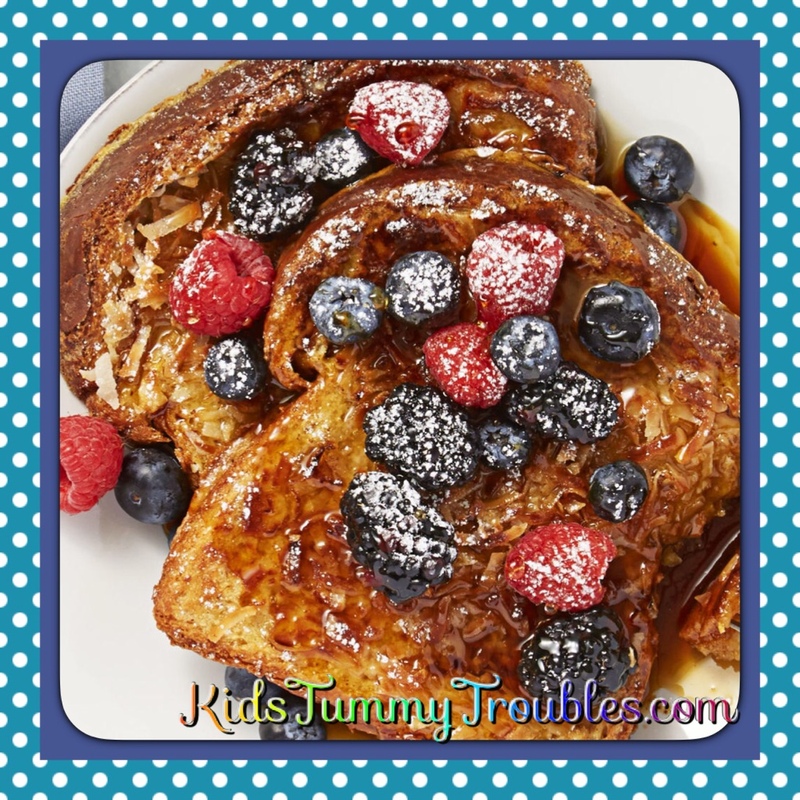 This french toast is a no brainer, it’s made with coconut milk, so its DAIRY FREE also!! The only issue was finding a delicious, flaky, sweet golden brown brioche bread to use. So instead of me reinventing the wheel I used a wonderful recipe for brioche bread that I found on Carol Kicinski’s site Simply Gluten Free. I highly recommend her recipe for Gluten Free Brioche. Whisk eggs, coconut milk, brown sugar, pumpkin pie spice, and a pinch of salt together. In a large nonstick skillet, heat 1 teaspoon vegetable oil on medium. Soak 4 slices of your bread in the egg mixture, letting excess drip off; add to skillet. Sprinkle each slice with sweetened shredded coconut; press to adhere. Cook 4 minutes or until bottom of bread is deep golden brown. Gently turn slices over; cook 2 minutes or until coconut flakes are deep golden brown. Transfer to parchment-lined cookie sheet and keep warm in 300 degrees F oven. Repeat with 4 more slices bread, adding another 1 teaspoon oil if necessary. Serve with mixed berries, confectioners’ sugar, and maple syrup, if desired. This weekend was beautiful. We are finally done with the 90 degree weather and it’s starting to feel like Fall! So of course that put me in the mood to start decorating. I pulled out all my Halloween and Fall decor. The girls had a blast putting the clings on the windows and helping me put out the decorations on the table. I tend to keep my decorating on the kid friendly side still. Big, bright colors and happy looking figures. Can’t wait til the girls get older and we can go a bit more scary but for now they love it. Once Autumn comes around I also start thinking of all the great things I can make with pumpkin. I have tried many different sauces to go with my favorite fall dishes. Many of them include a brown butter sage sauce. This however is definitely not great for cholesterol with the large amounts of butter they typically call for. 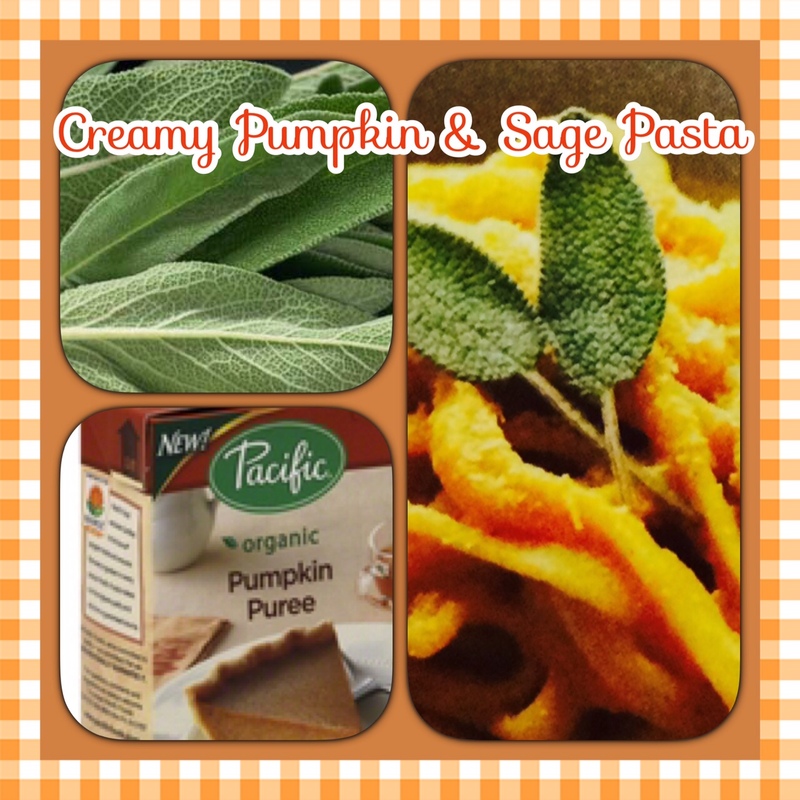 This recipe I love uses pumpkin puree and coconut oil. It is delicious over your pasta of choice, whether it’s spaghetti or your favorite seasonal ravioli. And this recipe is Dairy & Gluten free!! Saute onions until they begin to turn translucent, approximately 6-8 minutes. Add garlic and saute until fragrant, about 1 minute. Remove from heat and place onion and garlic mixture in a high speed blender. Add the pumpkin puree, almond milk, sage, pepper and salt. Blend until smooth. Prepare the pasta according to the package directions, drain and return pasta to pot. Add the pumpkin sauce and stir well over medium heat until hot. As promised here is the Potato Pizza Crust for the previous recipe that was a hit – Gluten Free Bacon and Egg Breakfast Pizza. 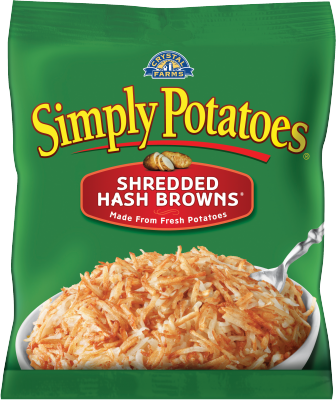 This crust is super easy, especially if you use the Simply Potatoes shredded potatoes. They do all the hard work for you by pre shredding it!! Grease bottom and sides of a large skillet. Press potatoes mixture evenly on bottom of pan and up to about 1 inch high on the sides of pan. Spray potatoes with cooking spray. Bake at 400 degrees F until browned or for about 20 minutes. It’s been a busy week with getting the girls ready for school. They are in 2 different schools this year and surprisingly my older one is more upset about it than my baby. 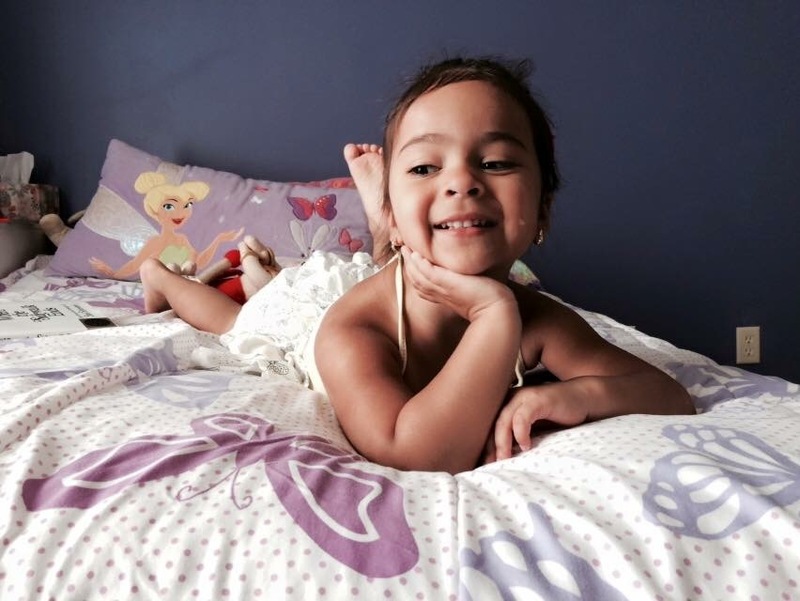 She said she is going to miss seeing her in the hallways at school. By the way they are only in Pre-K and Second Grade. But I love that they are so close and that my older one feels protective over her. We went back to school last week and then had our last summer weekend to enjoy. So this weekend we wanted it to be the perfect summer weekend. We had a pool day. 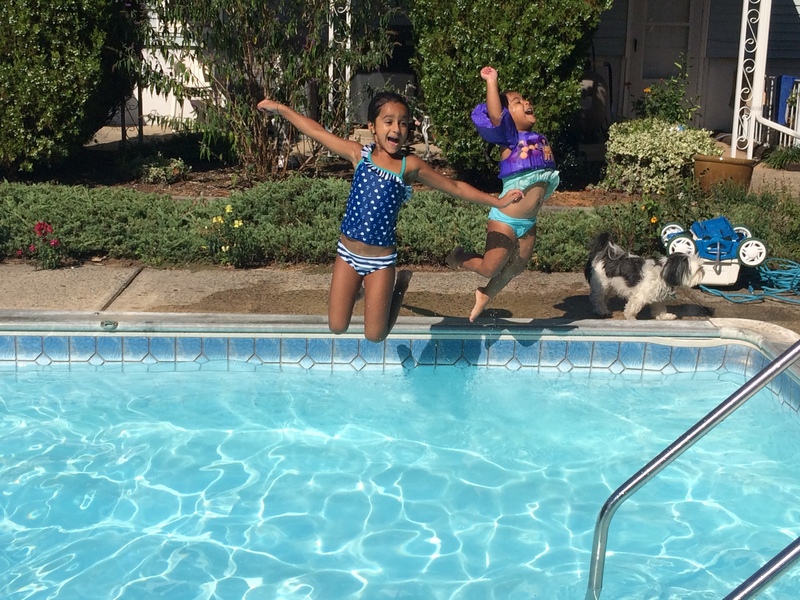 The girls had a blast jumping in the pool over and over again. 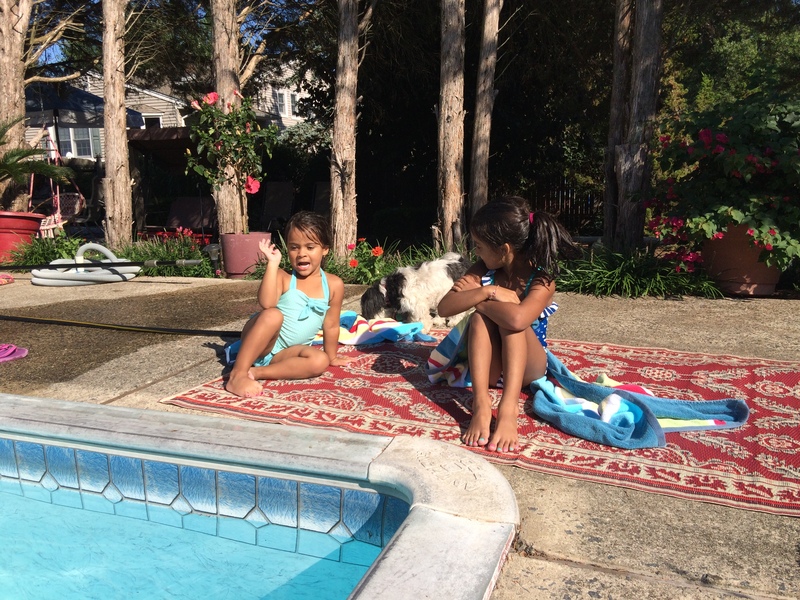 After the pool they basked in the sun to dry off in the company of the family dog. It looks like they were conspiring something, not sure what but definitely deep in conversation. The next day we were invited to a Labor Day BBQ but not until the late afternoon. My BIG MISTAKE, which I am sure every mom has done is that I actually told my children about these plans. They were bothering me about it from the second they woke up!! They couldn’t wait to get there to play with their friends. But we had to wait until after lunch. This is when I realized my kids were a captive audience so I decided to try out a new recipe for breakfast for the family. The girls are “Pizza Lovers” so who wouldn’t love Pizza for breakfast. My girls consider pizza its own food group so just calling this pizza to them makes it enticing. This recipe is Gluten Free. To make it Dairy Free substitute milk for Almond Milk and omit the cheese at the end. This recipe is easy to make, not time consuming and delicious. Cook the onions in a lightly oiled skillet over medium heat till translucent. Add garlic and decrease to low heat for 30-45 seconds. Remove from skillet and set aside. Combine the eggs and milk and beat. Add to the skillet. Cook until eggs are just set, stirring occasionally. Add the crumbled bacon and add in the onion and garlic back to the eggs. Season to taste with salt and pepper. Spoon the mixture onto the previously prepare Pizza Crust and sprinkle with cheese. Bake at 400 degrees F until the cheese is melted for approximately 5 minutes. Serve immediately.